New. Prizewinning photo journalist, Halim Berbar, teamed up with Penang's well known heritage activist, Khoo Salma Nasution, to produce this stunning book to remind us why Penang's capital George Town has been chosen as a UNESCO World Heritage Site. This 128 page book combines informative text and brilliant colour photographs to record not only the opulent historic homes of the wealthy but also the more humble dwellings which contributed equally to Penang's bustling growth. Introduction which gives us as much background as we need as to how Penang blossomed from a sleepy island of fishing villages to a prominent commercial centre. 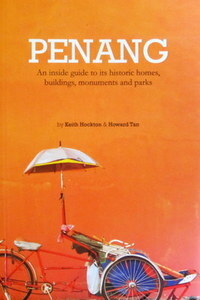 In doing this the author also begins to look at the influences which gave Penang its unique architecture. From Traditional House to Penang Bungalow where we're shown the traditional homes, constructed principally from wood, that first sprang up and how their design, with its emphasis on coolness and practicality, began to be developed into more permanent structures as the owners became more wealthy. In doing so the designers started using brick as well as features from other parts of Asia and Europe. From Shophouse to Terraced Dwelling House that traces the import of the typical Asian building that doubled as both a dwelling and a shop. Gradually its features were adapted by the growing middle class so that, in some cases, the building became exclusively used as a private residence. In a Chinese Courtyard Home traces the architectural developments that resulted from the growing wealth of some of the Chinese buisinessmen. Their growing confidence encouraged them to break out of the confines of the terraced shop house to build more substantial detached homes which were often also used as offices. Professional architects, designers and crafts people were given full reign to demonstrate the owner's wealth to the world. An Eclectic Home concentrates on three of the real jewels of Penang's architectural heritage, Woodville, Loke Villa and the Leong Yin Khean Mansion. These buildings demonstrate adaptations of French mannerist, the Arts and Crafts and Renaissance styles respectively. Published by Marshall Cavendish Editions, Singapore, 2009. First edition.